Of all the places the Hmong have settled, the least likely might be a small town in southwest Minnesota. In just three years the Hmong presence there has grown from a few people to more than a quarter of the community. The town is tiny but its name is known worldwide, thanks to a popular television show. That fame is one of the reasons the Hmong moved to town. Walnut Grove, Minn. — It's been a long journey for Harry Yang, one that has taken him from the mountains of northern Laos to a small town in southwest Minnesota. As a soldier he fought on the U.S. side in the Vietnam War. When the communists won, he fled to Thailand. The two-week-long walk took Yang and 200 family members up steep mountain slopes, through jungles and across rivers. Near the end of the journey Yang swam across the Mekong River with one of his children strapped to his back. He made it, but that moment of triumph soon turned tragic. "One thing I feel very bad, because I lost my mother on the river," Yang said. "My mother and my sister, they tie together. And they never show up on the other side." Yang came to the United States in 1980, first to Massachusetts, then to Minnesota. He bought a house in St. Paul. Upset with gangs and crime, Yang said he decided to leave the city three years ago. He looked at the outer suburbs of the Twin Cities first, but found housing prices too high. That's when his daughter made a suggestion. "She say you have to go farther than that," Yang says. "Like over a hundred mile or maybe two hundred mile. I say, 'Where?'" His daughter had a very specific location in mind. It was made famous by a television program. "'Little House on the Prairie,' that's her favorite show," Yang said. The television show is set in and around the small town of Walnut Grove in the 1870s. His daughter told Yang it would be a good place to raise children because the characters on the show seemed nice. The show, a television recreation of the books of Laura Ingalls Wilder, was based on real people who lived at Walnut Grove in pioneer days. As a child, Wilder lived for a time on a farm on the banks of Plum Creek, just outside town. So that's where Yang looked. He searched for a house in nearby towns like Tracy and Lamberton, but he found the best prices in Walnut Grove. He and his family moved there about three years ago. "It is a very good place that I have lived since I came to America," Yang said. "I feel like it's more freedom and no scary thing. And the children they come home every night." 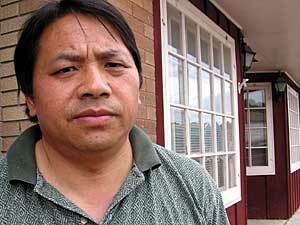 Once Yang gave his endorsement to life in Walnut Grove, other Hmong followed. Some were family members, some were not related to the Yangs. Yang estimated about 25 Hmong families now live in the town of 600, with more than 100 children. A total of 41,800 Hmong live in Minnesota, according to the 2000 U.S. census. Many of the adult Hmong in Walnut Grove have found jobs in nearby communities. Yang stayed in town, where he's opened an oriental food store on Main Street, the same street Wilder once walked. Until he moved to Walnut Grove, Yang said, he had never watched the television show. Now he's a fan, as are many of the Hmong, especially the children. Yang has also attended "Fragments of a Dream," a play about the Ingalls family performed during the summer in a natural amphitheater just west of Walnut Grove. Darla Bloch, an actor in the play, said it's inspiring to see a fresh group of immigrants in a community that has hosted many cultures through the years. "Minnesota has always had Germans, Swedes, Norwegians and now we have a very big Hmong influence coming in," Bloch said. "And I think we have room for everyone." In the play Bloch portrays Margaret Oleson, wife of a Walnut Grove store owner. Frustrated with life in Walnut Creek after grasshoppers destroyed the crops in the area, she wants to leave Walnut Grove. But the town survived the grasshopper crisis and prospered. And just as the people of Walnut Grove struggled through hard times in pioneer days, the Hmong are also determined. Most of the people in town are accepting and friendly, Yang said, but a few resent the Hmong. Once someone sent him an anonymous letter suggesting the Hmong leave Walnut Grove. Yang said he would love to talk to the person who wrote the letter. "Whoever do not understand us, we like to tell them. We like them to understand us," Yang said. "Because we live the same place, we live the same village, we cannot dislike each other." Yang is the rare person who sees the downturns in life as an opportunity. To him there is no problem that can't be solved, no river that can't be crossed. There may be a price to pay, but the other side holds great promise. Like the Ingalls family, Yang has moved west across America spurred on by dreams of a better life. His time in Walnut Grove is the latest stop in that journey.